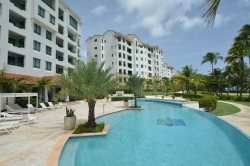 Nestled within Punta Candelero, one of Puerto Rico's most beautiful beaches, is Solarea Beach Resort, a luxurious complex of exquisitely appointed residences. This exceptional tropical space will feature a beautifully landscaped property, including fresh water lakes, uniquely contoured swimming pool, spectacular recreational areas, and access to the world-class amenities of Palmas del Mar Resort. * Private Entrance with security guard seven days a week 24 hours. * Magnificent pool with Jacuzzi and separate play pool with amenities for kids. * Gazebo with BBQ facilities and private baths and showers. * Fully equipped Air-conditioned Gym. * Private Lounge with bar with a fully equipped kitchen specially design for private parties at your convenience. * Private access by foot or golf cart to the most wonderful beach at Palmas; Punta Candelero. * Generator and Cistern to run all buildings. * Two parking’s per apartment and visitors parking available.